After taking part in two illustration challenges, one after the other, I think I had run out of puff with posting daily. I ended up using some of the month doing some research relating to style and the direction I want to go which is just building on a love that I already had with the patterning, textures and trying to be more economical with my use of colour in an attempt to make my work more interesting. I have been a fan of Andy Warhol’s and Mary Blair’s commercial illustrations for a long time, and when I left school my intention was to be a commercial artist/illustrator but got side tracked by learning about graphic design, which has been extremely helpful as it has developed my visual language, taught me to treat design problems as a designer, weighing up objectives and budgets to work out the best solution, taught me the intricacies of preparing art for print and then later, online use; all of these skills I use daily in my work. I ended up participating in the Mid-Century Masterclass, with Dustin Lee from Retro Supply and Brad Woodward from Brave the Woods. It was an excellent masterclass that ran across two sessions with a group of enthusiastic illustrators and a great swag of brushes and textures to play with. I think that it is crucial to keep learning and developing my skills, and the class was great fun. November was also all about making my designed fabrics into tea towels and preparing for the Hunter Arts Network’s Art Bazaar which took place mid November. It was a great opportunity to catch up with some fans of my work and to see what offerings that they would like to see next. I also created a new wallpaper design for the large scale black and white challenge run by Spoonflower. 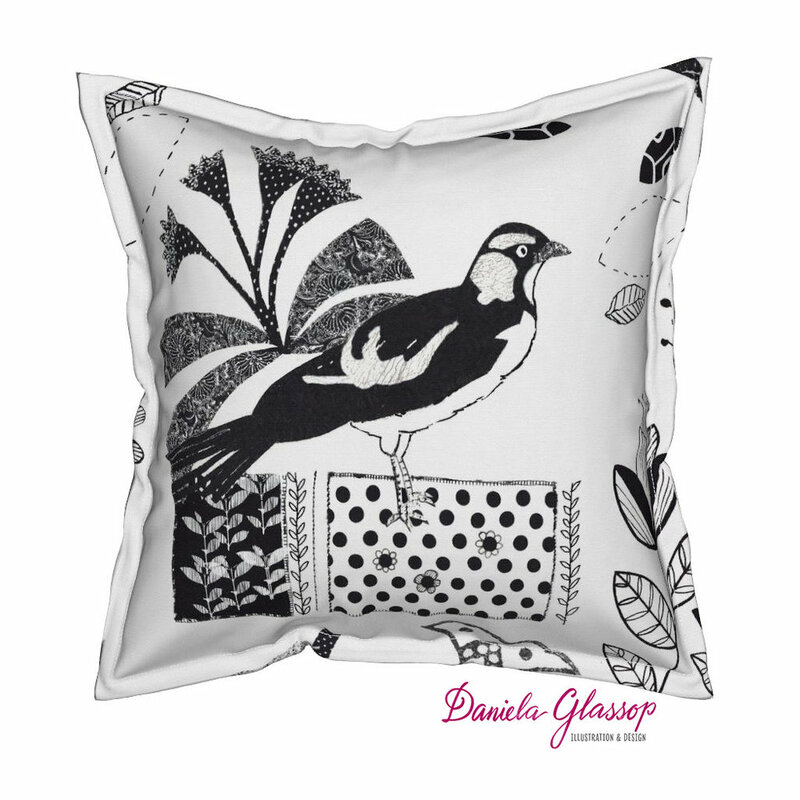 I ended up joining in as I already had the start of a design as I had been working on a new fibre art work also following a black and white theme, which was based on the bird families that frequent my garden who also tend to be black and white. We have magpies, peewees or magpie larks, butcher birds and the occasional visit by a young cockatoo. The fibre art will be on display at Timeless Textiles gallery as part of a group NCEATA (Newcastle Creative Embroiderers and Fibre Artists), which will be on view from the 23rd December to 13th January, with the official opening night, on the 3rd January, 2019. Timeless textiles is located at 90 Hunter Street, Newcastle East. The wallpaper is available from my Spoonflower and Roostery shops and is called ‘Visitors to my Garden‘. Amongst all of this I did design some greeting cards and put the wheels in motion to set up an Etsy shop. The collectable linen and cotton blend tea towels with my illustrations on them that were available at the Art Bazaar are now available from my Etsy shop. The shop is called DanielaGlassopStudio (an Etsy convention to not have spaces in the name) and it can be found via the menu in my web site and via this link: DanielaGlassopStudio My intention is to keep carrying my illustrated tea towels as they are a great way to display art that is less fragile and art that can be seen and used daily and to add gicleè prints taken from my illustrations, greeting cards, stickers and small canvas paintings. I am also currently participating in Victoria Johnson’s online course, Create Christmas so that I can add more Christmas designs to my offerings and it is helpful to get someone else’s perspective on how to approach any kind of problem. Victoria’s prompts, colour schemes and trend boards are always inspiring. As I have been so busy setting all of this up that I have not yet got around to sending out a newsletter. My plan is to have a break and a family holiday in January and start afresh towards the end of January, when school goes back in NSW, Australia. The newsletter will give details as to what will be coming up next year so that you get first dibs, and info about things I think you might like. I am hoping to mix it up to keep it interesting. Hoping that all your Christmas preparations and time with your families and friends is wonderful and revives you for another great year.